Would you recognise a stroke? Brin was glad that his wife did! Did you know there are different types of Stroke, view the below video to find out more. Wednesday 17th September 2014 – 11.00am – Suzie Wheaton. Brin Helliwell was only 47 when he suffered a stroke after being involved in a road traffic collision. Thanks to the swift actions of his wife in recognising the symptoms, ambulance crews were at his door within minutes. 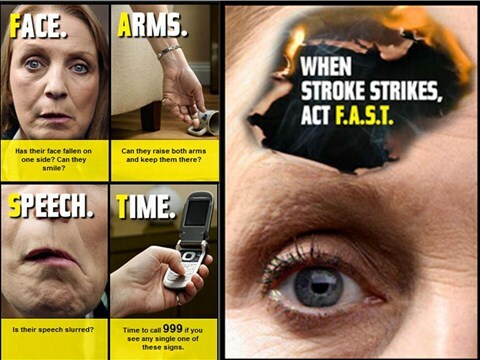 Every year, approximately 152,000 people in the UK have a stroke. On average West Midlands Ambulance Service receives a call every 20 minutes to a patient having a suspected stroke. Anyone can suffer a stroke, with almost one third of strokes happening to people under the age of 65. Stroke is the fourth largest killer in the UK, which is why it is so important to recognise the symptoms of stroke FAST! The sooner a stroke is discovered, the sooner it can be treated and the greater the person’s chances of survival and recovery. Brin from Sutton Coldfield suffered a stroke in 2005. Talking about his experience Brin said: “On the 31st August 2005, I had an accident whilst cycling to work. I went to hospital with a shoulder injury which was treated and I was discharged. Later that day I felt very, very tired, a crushing tiredness and I thought I was going into shock. I got up to make a telephone call and my wife started yelling at me to sit down. I did and she told that I had stumbled into the door frame and that my speech was all slurred. “We made a mistake and phoned the doctors first but luckily they said to call 999 straight away and within minutes the ambulance arrived. I went to get off the settee and I was totally paralysed down my left side. “I’d gone from being a super fit 47-year-old with no other illnesses or problems to being paralysed and that started a long story of hope and despair. I am now full of lots of hope for the future. “I have fantastic family and friends that have supported me. At the time, I had three teenage lads, so I had everything to live for and get better for. With the help of the physiotherapists and pushing myself every day, I finally got the feeling back in my limbs and I was discharged in December 2005. Andy Rosser, WMAS Stroke Liaison Officer, said: “A stroke occurs when the blood flow to part of the brain is interrupted. Without this blood, brain cells quickly begin to die. It is estimated that for every minute that the brain is without this vital blood, carrying oxygen and nutrients, that 1.9 million brain cells die. This is why it is so imperative to act FAST. “The classic symptoms of stroke are picked up through the FAST test*. The most common signs include facial weakness, loss of sensation or range of movement in one arm and noticeable slurred speech or difficulty in finding words. If any of these are noticeable, dial 999 immediately. “Ambulance crews will carry out quick tests to determine a stroke. The ambulance crew will then transport the patient to one of the stroke centres in the region. This may not be your nearest hospital but one which will be able to provide specialist stroke care. “Ambulance crews will pre-alert the specialist units and get patients there as quickly as possible. Once in hospital, patients should have a brain scan to determine if the stroke was caused by a blocked artery or a burst blood vessel; which part of the brain has been affected; and how severe the stroke is. Medics will then determine the best treatment to help minimise the effects of the condition. FACIAL weakness: Can the person smile? Has their mouth or eye drooped? ARM weakness: Can the person raise both arms? Next Entry Not all strokes are preventable, however, in some case lifestyles changes can help to reduce the risk.